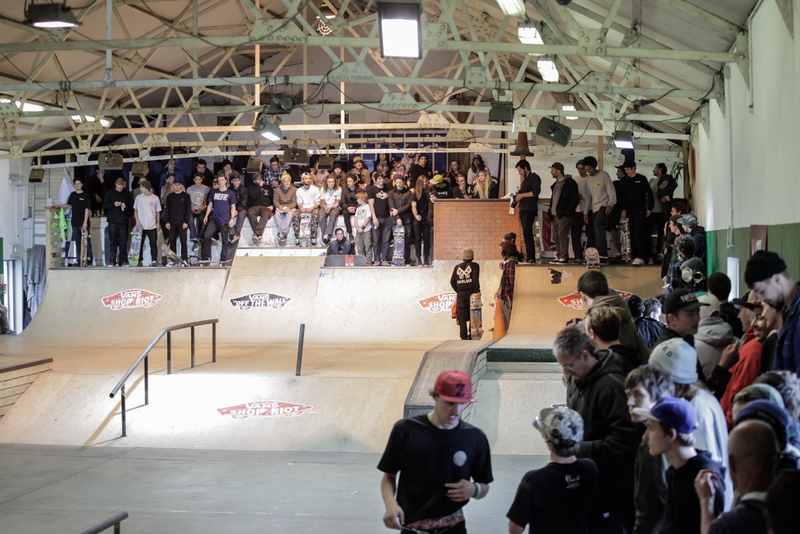 On Saturday APRIL 25TH 2015, shops from all over the UK arrived in St Albans for a practice skate day, complimentary waffles, drinks and skate films ahead of Sunday’s competition. Vans also brought their own mini ramp along for the event, which made its home in the car park for all to skate all weekend. By Sunday lunchtime, Pioneer Skatepark quickly filled out. Just like old skate comps, people lined the walls of the park trying to get a good view, but not get in the way. 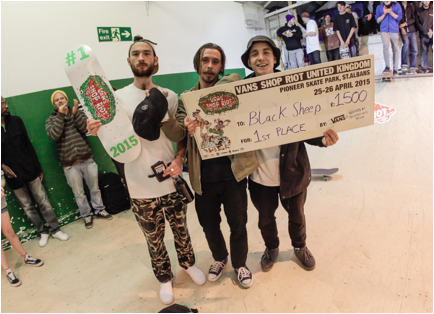 Some of the favourites included last years winners Lost Art & Skate Pharmacy, along with the usual heavy hitters Black Sheep, Fifty-Fifty, Forty Two, Route One and many more. 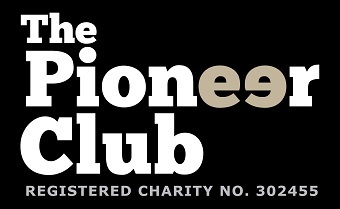 In total, 27 shop teams went head to head with 3-minute runs in a bid to make it through to the 4 team final, selected by legendary judges, Rodney Clarke, Andy Willis & Nick Zorlac. 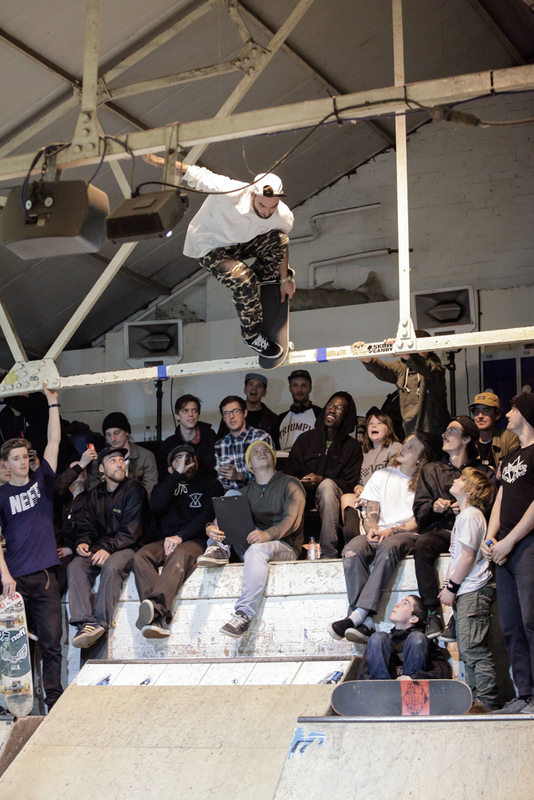 With so many good skaters it’s hard to pick names out, but after some strong runs from all teams involved, the standouts where Fifty-Fifty, Forty Two, BBC and The Black Sheep, who all went through to the final. Korahn Gayle from Fifty-Fifty had his usual lazy yet solid style. Alex Halford from Forty Two was on his usual good form, along with the rest of the team who killed it as a whole. Luke Jarvis from BBC was charging the park, attacking everything at full speed. Alex Decunha also from BBC was skating on a real technical level with some amazing tricks. However in the end it was The Black Sheep who took the top spot, using every feature and dominating the park. Rob Smith was going huge, with ally-oop 360 transfers from quarter to wall-ride, along with backside flip footplants. Harry Lintell & Jiri Bulin owned the park, landing technical hammers every second: switch back lip, kickflip front board, over crook back 180… list goes on. A well deserved win that will see them heading out to Europe to compete in the finals later this year. Thanks to Ann Brooks and all Pioneer staff, Marc Churchill for working the mic, the judges, Louis Tagliaferro at Red Bull, Shiner distribution and everyone for coming down and making it a rad day.